When using Sentle you can add events of different types to your calendar ranging from simple reminders to service appointments. This article covers the different types of events that can be scheduled and their associated settings. Appointments for client services can be added allowing you to assign a specific service, staff member and resource to the appointment. When adding an appointment, the client or customer involved will receive a text update (if chosen) and will also receive a reminder pre-appointment based on how you have them configured. Set the start and end date and time or mark the appointment as all day. Add an address to the appointment. This can be a link to an address within your system, found using the google look up or added manually. Add a service if you have them configured within your calendar settings. Add staff members, you will be assigned to the appointment by default although you can remove yourself if setting up the appointment for somebody else. If you leave the 'notify Sentle users' box ticked then they will receive push notifications about the meeting via the Sentle app. A resource can be assigned to the appointment (such as a meeting room or specific piece of equipment) if you have them configured with your calendar settings. Add a sentle contact by using the 'search contacts' box. As you start typing you will be presented with a list of matching contact names from which you can select the relevant contact. Any previous appointments related to this contact will be displayed in the window. 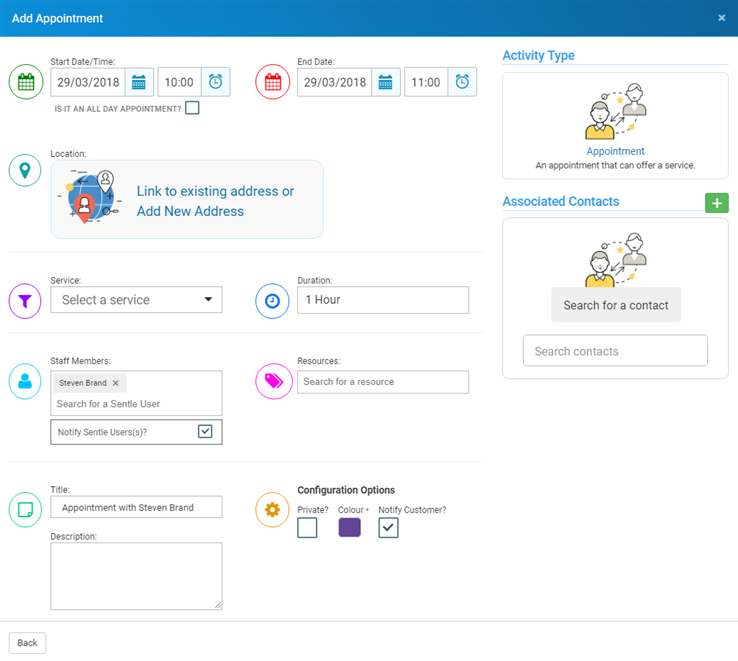 If you check the ‘Private’ box the appointment details will not show to other Sentle users although they will be able to see that you are marked as busy at this time in the calendar. Both the Contact and Sentle user have been chosen with an appointment room chosen as the resource. They both have the ‘notify contact(s)’ box ticked so will receive a message when the appointment is created as well as scheduled reminders. The title of the appointment is created based on the service and associated contacts and staff members. Notes can be added before selecting ‘schedule appointment’ to add to the calendar. Much like appointments, when a meeting is scheduled if desired your client or contact will receive an automated text alert informing them that the meeting has been set up and will also be sent a reminder in line with how your automated communications are configured. When scheduling a meeting the option to assign a service will not be available. You can set the meeting as private, meaning that other Sentle users will see you as busy in the calendar but will not see any details of the meeting. Reminders are ‘point of time’ events and are only available to Sentle users (staff) A notification will be sent to the Sentle user that is associated to the reminder. You can set the reminder as private, meaning that other Sentle users will see you as busy in the calendar but will not see any details of the meeting. This is a specific reminder to call a contact where you can add notes to the event when scheduling so you can make the call with the context at your fingertips. You can schedule tasks with specific durations for Sentle users (staff) so a quick glance at the calendar will give you a view of what tasks users have assigned to them. Staff holidays can also be added to the calendar, offering other staff a shared view of holidays on the calendar.